This RuneQuest supplement enables you to create and define kingdoms and empires as playable entities. Simulate the rise and fall of mighty imperial states, managing their resources and economies, resisting and predations of rivals and dominating those who would move against you. And, at a more human level, manage estates and holdings from year to year keeping the populace happy whilst dealing with the ravages of nature, rivals and the demands of your peers. 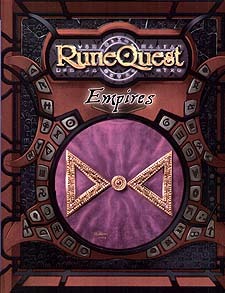 RuneQuest Empires provides all the tools needed for running high-level games, and for integrating RuneQuest characters into the action. A game within a game, it aims to add a new dimension to the rich world of RuneQuest.